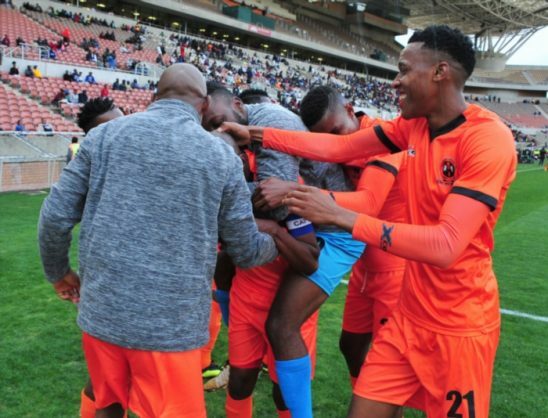 Polokwane City were comfortable 2-0 winners over a somewhat lacklustre Baroka FC in a league encounter at the Peter Mokaba Stadium on Saturday. In the five previous matches between the two Limpopo rivals, there had been four league draws and one win in the Nedbank Cup. But goals from Walter Musona and Jabulani Maluleke in each half made it an afternoon to remember for Polokwane City, who were full value for the three points, their first of the season after two previous defeats. In what was generally a quiet start, Rise and Shine began to stamp their authority as the game progressed and had the first couple of chances when Salulani Phiri fired a shot straight at Baroka keeper Ayanda Dlamini before Rodney Ramagalela went close with a well struck effort from range. The breakthrough came on 35 minutes, when some very sloppy play in the Baroka defence saw Mohamed Anas stealing the ball off Dlamini before pulling back a cross for Musona, who did well to guide the ball into the far corner. The Thohoyandou team were struggling to find their rhythm in attack, although they were close to levelling the game up in first half added time through Thabo Moseki, whose glancing header was brilliantly saved by home keeper George Chigova. Baroka also began the second half with good intent, but for all their effort they failed to overly trouble the Polokwane goal. Instead it was again Rise and Shine who snatched back the initiative, and they had two chances in quick succession on the hour mark as Ramagalela narrowly missed finding Anas with a cross from the right, before the latter shot wide from 16-yards out with the goal at his mercy. The writing was looking to be on the wall for the visitors and their fate was all but sealed 20 minutes from time when Anas played in Ramagalela, whose square ball across goal was finished emphatically by Maluleke. It was almost 3-0 when substitute Thando Booi went clean in on goal, but Dlamini did well to rush out to make the block. Dlamini again denied Booi in added time as the hosts cruised through to the finish line with ease.